This rune shield was a gift to the Knights of Dawn centuries ago. 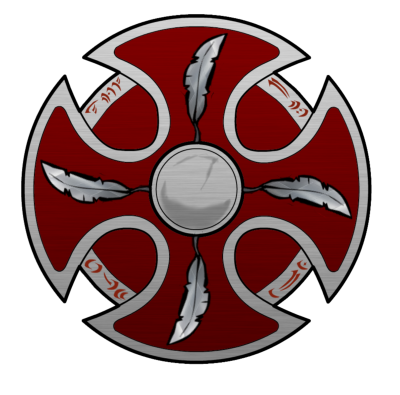 It, like the rune sword Lathatatlan, is given to the most worthy Palladin of the order. It is currently in the hands of Sir Quixis Ote, awarded to him by the leadership when his mentor, Sir Niklas Thorpe, retired from active duty. This Feather Shield has the some of the magic abilities of Horus himself! It makes the holder impervious to fire, gives the bearer an overall hardened skin (AR13), as well as granting the following spells, which may each be cast three times per 24 hours, at 6th level strength. It also has 140 SDC, and regenerates 10 SDC/minute. It cannot be destructed, but loses its powers except regeneration when its SDC is exhausted.